The region of Šalčininkai hosted the participants of “Artistic Talents Festival” project, executed by the Foundation “Oder-Niemen” from Wroclaw. Artists of Polish origin from Lithuania, Ukraine, Belarus, Romania and Moldova, and also from Poland, conducted the art workshops in Turgiele, and made music together in Biala Waka (Baltoji Vokė). The main aim of the “Artistic Talents Festival” project is to enable the artists of Polish origin from Central and Eastern Europe to meet on the basis of professional ground and to present their own accomplishments. The idea of the project is the participation of the artists who for various reasons have limited contact with their colleagues from Poland and other countries: they are the creators of small villages, remote from big centres, from the regions that are less accessible because of political reasons. The project was divided into three stages of meetings in which there are workshops, presentations of the artists and their achievements, making music together and discussion boards. 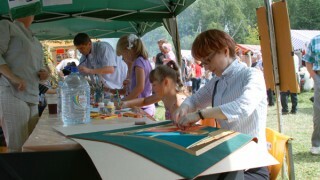 The first part of the “Artistic Talents Festival” was held in June 2014 at Bukowina Rumuńska. Among the participants, there were e.g. the representatives of the Cultural Centre of Šalčininkai. The second part of the festival was held in mid-August in Lithuania, in the Šalčininkai region. In Turgiele, during the celebration of the holiday of the Assumption of the Virgin Mary, the participants organised art workshops for all keen on it. They could learn e.g. decoupage – the art of decorating objects. Children, with the help of a painter from Gdansk, Anna Szpadzińska-Koss, painted pictures of the Virgin Mary. There was also an exhibition of paintings, sculptures and other works, made by the participants of the project. The following meeting of the artistic talents from Poland, Belarus, Ukraine, Romania and Moldova took place at the Cultural Centre of Biała Waka (Baltoji Vokė). During the concert, there performed Polish artistic groups from the countries participating in the project, including the Etnographical Group “Turgielanka” from Turgiele. The participants of the “Artistic Talents Festival” project are going to meet once again this year – this time in Poland.